A collection of stories and 100 sweet and savory French-inspired recipes from popular food blogger David Lebovitz, reflecting the way Parisians eat today and featuring lush photography taken around Paris and in David's Parisian kitchen. In 2004, David Lebovitz packed up his most treasured cookbooks, a well-worn cast-iron skillet, and his laptop and moved to Paris. In that time, the culinary culture of France has shifted as a new generation of chefs and home cooks--most notably in Paris--incorporates ingredients and techniques from around the world into traditional French dishes. In My Paris Kitchen, David remasters the classics, introduces lesser-known fare, and presents 100 sweet and savory recipes that reflect the way modern Parisians eat today. You'll find Soupe à l'oignon, Cassoulet, Coq au vin, and Croque-monsieur, as well as Smoky barbecue-style pork, Lamb shank tagine, Dukkah-roasted cauliflower, Salt cod fritters with tartar sauce, and Wheat berry salad with radicchio, root vegetables, and pomegranate. And of course, there's dessert: Warm chocolate cake with salted butter caramel sauce, Duck fat cookies, Bay leaf poundcake with orange glaze, French cheesecake...and the list goes on. David also shares stories told with his trademark wit and humor, and lush photography taken on location around Paris and in David's kitchen reveals the quirks, trials, beauty, and joys of life in the culinary capital of the world. "David Lebovitz is a rare specimen: both a terrific storyteller and a brilliant, uncompromising recipe writer. His lighthearted, almost satirical style is combined with far-reaching knowledge of food and its context. I'd follow him blindfolded on this journey to the City of Light." "David Lebovitz is a chef who can write better than most food writers, a writer who can hold his own in any restaurant kitchen in the world, and, most of all, a guy who simply rejoices in food and cooking. This may be his most personal cookbook, describing all facets of his cooking life in Paris, with great stories, information, and recipes. I need two copies of this book: one for the kitchen and another by my reading chair." "Opening this beautiful book is like opening the door to David's Paris. Of course, you get great recipes, but you also get to wander the world's most delicious city with a friend who knows it well and is excited to share it with you. 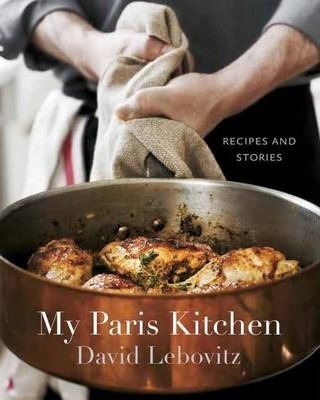 A treat for those of us who love French home cooking, Paris, and David's take on it all." "David Lebovitz is the ultimate American in Paris and this book is the ultimate insight into his beautiful and delicious world. I am beyond jealous!" In My Paris Kitchen, Lebovitz weaves together inviting and insightful tales about his adopted city with a collection of smart, fun recipes. Some of these are total French classics-think oeufs mayo and green lentil salad-while others give a nod to the ethnic diversity in the city. In a nod to his pastry background, Lebovitz includes a substantial dessert section, but it's clear from the breadth of the book that his Paris kitchen is filled with so much more than sweets. Here is a cookbook to take to a comfy chair and read cover to cover. -Yotam Ottolenghi, coauthor of Jerusalem "David Lebovitz is a chef who can write better than most food writers, a writer who can hold his own in any restaurant kitchen in the world, and, most of all, a guy who simply rejoices in food and cooking. This may be his most personal cookbook, describing all facets of his cooking life in Paris, with great stories, information, and recipes. I need two copies of this book: one for the kitchen and another by my reading chair." -Michael Ruhlman, author of Ruhlman's Twenty "Opening this beautiful book is like opening the door to David's Paris. Of course, you get great recipes, but you also get to wander the world's most delicious city with a friend who knows it well and is excited to share it with you. A treat for those of us who love French home cooking, Paris, and David's take on it all." -Suzanne Goin, author of The A.O.C. Cookbook In My Paris Kitchen, Lebovitz weaves together inviting and insightful tales about his adopted city with a collection of smart, fun recipes. Some of these are total French classics--think oeufs mayo and green lentil salad--while others give a nod to the ethnic diversity in the city. In a nod to his pastry background, Lebovitz includes a substantial dessert section, but it's clear from the breadth of the book that his Paris kitchen is filled with so much more than sweets. Here is a cookbook to take to a comfy chair and read cover to cover. DAVID LEBOVITZ has been a professional cook and baker for most of his life; he spent nearly thirteen years at Berkeley's Chez Panisse until he left the restaurant business in 1999 to write books. He is the author of six books, including My Paris Kitchen, The Sweet Life in Paris, and The Perfect Scoop. David has been featured in Bon Appétit, Food & Wine, Cook's Illustrated, the Los Angeles Times, Saveur, Travel + Leisure, the New York Times, and more. He moved to Paris in 2004 and turned davidlebovitz.com into one of the first phenomenally popular food and living blogs.